“Every time I hear the sound of the plane, I remember the day of the massacre,” says Nadeen, a 10-year-old survivor of a school attack in al-Haas, a town in northwestern Syria. “The thing that I most remember is that I saw books with blood, and I just saw a hand holding a backpack with no body,” she recounts. On a Wednesday morning in October 2016, while classes were in session, joint Russian-Syrian air forces dropped high-explosive missiles on her school and four others in the vicinity. The aerial bombing resulted in one of the deadliest attack on schools to date in Syria’s civil war, killing 41 civilians, including 22 children. Nadeen’s story is just one among countless others of lives irrevocably changed as the result of attacks on nearly 1,300 schools that have been counted from 2011 to mid-2017. These attacks and their real-life impact on the children, families, and communities are the focus on a new report project, entitled “’We Didn’t Think It Would Hit Us:’ Understanding the Impact of Attacks on Schools in Syria.” The report is the product of Save Syrian Schools, a collaborative project led by 10 Syrian civil society organizations and the International Center for Transitional Justice (ICTJ) that demands an end to the killing of Syrian children and justice for the bombing of schools. As Syria’s brutal civil war grinds on into its eighth year, the death and destruction it leaves in its wake continue to mount to ever more unthinkable heights. The statistics alone attest to its infamy as one of the largest international calamities in recent history. Violations Documentation Center (VDC), one of the 11 organizations of the Save Syrian Schools project, has recorded 182,422 verified deaths, though other sources put the total death toll closer to half a million. VDC estimates that civilians including children make up over 70 percent of these deaths and that 19,555 children were killed between early 2011 and December 2016. The conflict has also displaced more than 12.2 million Syrians from their homes, with more than 5.6 million of them fleeing the country. And thousands have been forcibly disappeared and tortured or have suffered any number of other human rights violations. The figures specific to Syria’s education system are deplorable in their own right. In a report issued in late 2014, relatively early in the conflict, the UN Secretary General found that 4,072 schools had been closed, damaged, or repurposed. This number has since risen, and sources are now estimating that one in three schools have ceased operation for one or more of these reasons. The impact is devastating: In 2012, the year after the conflict began, the percentage of students continuing to secondary school dropped from 98 percent to only 57 percent, and in the 2015-16 school year at least 2.3 million Syrian children inside Syria and in neighboring countries were out of school, and 1.3 million were at risk of dropping out of school. It is in the context of these numbers that the Save Syrian Schools partner organizations came together to shine a light on attacks on schools and their devastating impact. All 10 of the Syrian organizations have been actively engaged in various advocacy, storytelling, peace, and transitional justice efforts since the outbreak of violence. Some have been methodically documenting the human rights violations, in the now dashed hopes the conflict would end quickly and the perpetrators would be brought to justice swiftly. 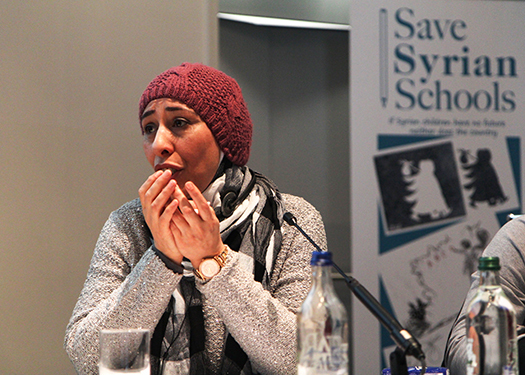 The Save Syrian Schools project combines and augments the partners’ different organizational strengths in documentation, victim protection, and advocacy. “We Didn’t Think It Would Hit Us” is the culmination of an unprecedented collaboration to protect schools in Syria from further devastation. It examines the legal dimensions of attacks on schools, as well as the impact on students, teachers, families, communities, and Syrian society as a whole. The partners’ documentation efforts—including databases and archives detailing individual attacks, casualties, and likely perpetrators—as well as interviews with students, teachers and other school staff, parents, and community members form the basis of the report. The findings are sobering, the testimonies heartbreaking. They leave no doubt that the harms will take decades to be remedied, even if they are meaningfully addressed. As part of its analysis of how international humanitarian law (IHL) applies to the violations, the report describes seven particular attacks. It concludes that the Syrian government and other parties appear to have violated the Geneva Conventions and many of the foundational human rights norms, as well as the Convention on the Rights of the Child and other treaties. The report offers a number of recommendations. The partners demand that all parties to the conflict cease their attacks on schools and respect IHL. They propose that schools be accorded the same level of protection under IHL as hospitals and places of worship and cultural heritage. They recommend that accountability measures for perpetrators, acknowledgment of harms committed, and comprehensive reparations be included in future peace agreements or other key negotiations or policies in Syria, as a means of providing justice. They urge that immediate steps be taken to rebuild Syria’s education system, including curriculum reform and offering accelerated learning options and other measures for students who were forced to miss long periods of school. And they ask that attention be paid to the effects of school attacks on individuals and society and that the needs and priorities of all those affected be incorporated in redress, acknowledgment, and reform policies. As bystanders, we know that the war in Syria is widely one of the most documented conflicts in history. Media coverage, images, videos, and witness testimonies are easily accessible online and across social media channels. In addition, dozens of organizations both inside and outside Syria, including several Save Syrian Schools partners, have been collecting evidence of human rights violations and breaches of international humanitarian law since the outbreak of violence. For most of these organizations, this documentation was originally intended for use in some future criminal accountability proceedings, whether in Syria or in an international venue. But as the war drags on, the possibility for such criminal accountability remains limited to a few ongoing cases tried under the principle of universal jurisdiction in a handful of European countries. The International Impartial and Independent Mechanism, which was created by the General Assembly to assist the investigation and prosecution of persons responsible for the most serious crimes committed in Syria since 2011, is another avenue for recourse, but its ongoing efforts are yet to materialize. In spite of emotional fatigue and the knowledge that their documentation may never be used to bring perpetrators to justice, human rights workers press on. The report argues that their work is not in vain, as it can serve the valid, justice-related purposes of storytelling, truth seeking, and acknowledgment. This is the ultimate value of the Save Syrian Schools report: It gives voice to the invisible victims of school attacks, helping them to take an active role in shaping the narrative of the conflict and ensuring that warrior and military accounts do not control it entirely. Their stories and testimony also contribute to truth-seeking efforts and help build the case for the acknowledgment to which they are entitled from the Syrian government and other responsible actors. This report is not just another testament to the atrocities that the Syrian conflict has wreaked on the lives of innocent children, families, and communities. It also serves as an example of effectively using documentation to amplify victims’ voices and pursue justice beyond criminal accountability. More broadly still, it sends a loud, clear, and unified message to the international community that attacks on schools and killing of children must stop now and that concrete steps must be taken toward justice.